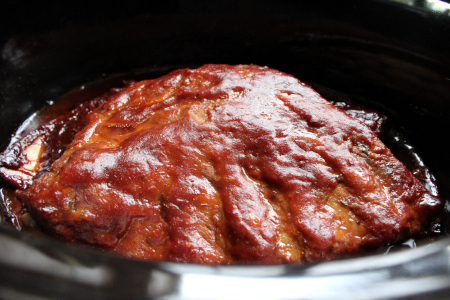 Crock Pot Barbecue Pork Ribs: Can You Tell The Difference? Crock pot barbecue pork ribs are perfect for Winter BBQ flavor with that fall off the bone texture that we all love. Slow cooking in a crock pot exactly mimics the low and slow cooking that we do when smoking so when it is just too cold outside, it's time to get your slow cooker fired up and use this recipe. The other great thing to be said about the slow cooker is that you can set it off in the morning, go to work and come back to a perfectly cooked side of BBQ ribs. Super convenient, and with a preparation time of just 45 minutes you won't have to get up extra early to set everything off. That said, crock pot barbecue pork ribs aren't perfect. You won't get any crispy bark, you won't get a pink smoke ring and if you cook in sauce you can get a lot of fat deposited in the sauce so I brown my ribs in the oven first. It adds a little crisp to the edges. It adds buckets of flavour because the Maillard reaction takes place. 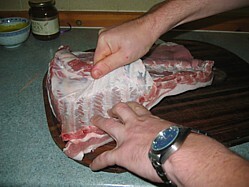 It renders much of the fat so that you can pour it away before your start the slow cooking. The choice of barbecue sauce to go on these ribs is really up to you. This barbecue ribs recipe is spiced up with chillies so not for the faint hearted. Try my oriental style if you prefer something a little less spicy. This might be a crock pot barbecue pork ribs recipe but your still need to prepare your rack of ribs as if they were going in the smoker by removing the membrane from the back of the rack. 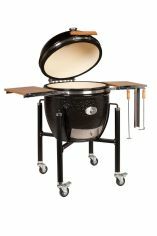 You might also need to cut your rack in half because not many slow cookers will take a whole rack. Mix all the ingredients together (except the barbecue sauce) in a bowl, place your ribs in a baking dish and paste the mix all over the ribs. 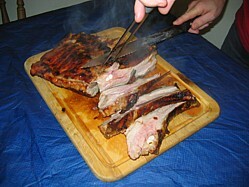 Pre-heat your oven to 200°C (400°F) and bake the ribs for 30 minutes, turning them over at the half way stage. Make up the barbecue sauce whilst the ribs are in the oven simply by throwing all the ingredients in a pan and stirring as you warm it through. When the ribs have had their time in the oven you can lift them out of the baking dish leaving any rendered fat behind and pop the ribs in the crock pot. Make sure that they're "standing up" on their edge with the meaty side facing outwards, pour over the barbecue sauce and cook on low for 8 hours and you'll have beautifully tender ribs. To finish (optional), you can caramelize the ribs by giving then a further 15 minutes in the oven at 200°C (400°F) and afterwards mop with a little more barbecue sauce if necessary. TIP - When cleaning your crock pot use hot soapy water and a nylon scrubber. Never use a brillo because you'll scratch the surface of the pot. Stains can be removed by cooking water and white vinegar on the "high" setting for around two hours.